Fast-food chain KFC has filed lawsuits against three companies that allegedly circulated defamatory rumors online about the company, including claims that it rears eight-legged chickens. 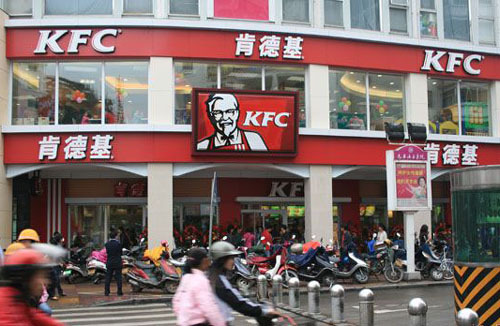 Shanghai's Xuhui District People's Court yesterday confirmed it has accepted the case in which KFC is suing three companies based in Guangdong and Shanxi provinces for a combined 3.5 million yuan (US$565,000). The plaintiff, which has its Chinese headquarters in Shanghai, said the libelous comments were posted on 10 WeChat accounts operated by Yingchenanzhi Success and Culture Communication, Shanxi Weilukuang Technology Co and Taiyuan Zero Point Technology Co. It is also demanding apologies from the three companies. Among the alleged rumors was a comment made by an unnamed Guangzhou resident on the "Guangzhou Men and Women" WeChat account — operated by Yingchenanzhi — that a KFC chicken product delivered to his home contained maggots. Another described an anonymous visitor's alleged trip to KFC's poultry farm in the United States, where the person claimed to have seen severely deformed birds. "The rumors about KFC using chickens with six wings and eight legs have been around for a long time," KFC Corp president Qu Cuirong said in a statement yesterday. "The rumors were first spread through e-mail ... and are now being seen on WeChat and Weibo." Several of the rumors on WeChat were accompanied by photographs of deformed chickens, she said, adding that the images had been digitally manipulated. The company decided to take legal action after identifying more 4,000 defamatory messages, which have been read an estimated 100,000 times, she said. In response to the claims that KFC breeds chickens with more than two wings or legs, Qu said that the company is not yet capable of such things. The company decided "to sue 10 accounts operated by three companies at this time," but that it has not ruled out further action, she said. Companies find it difficult to protect their brands against rumors because of the difficulties in collecting evidence, Qu said. "But the stepped-up efforts by the (Chinese) government in recent years to purify the online environment, as well as some judicial interpretations, have offered us confidence and weapons," she said.